When the call came in first thing yesterday morning for the resident biologist, I knew it was going to be a long day. 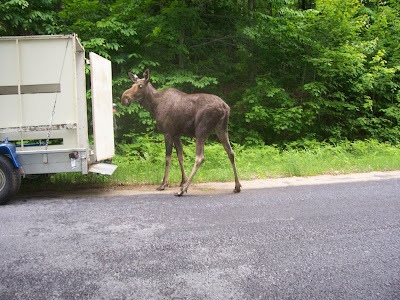 A young cow moose decided to visit the lovely spa town of Saratoga Springs, just south of the Adirondack Park Blue Line. Handily, the young lady decided to kick back for a rest inside the Saratoga race track. The officials there locked the gates and waited while the Department of Environmental Conservation (DEC) staff from Albany and here in Raybrook, made their way to the rescue. This was definitely going to be a relocation effort. A moose loose in a densely populated area is not a good situation. It is a matter of safety; public and moose safety. 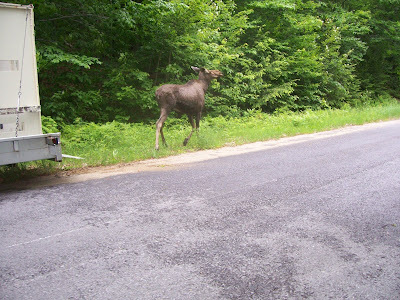 Since the Village of Saratoga Springs is surrounded either by city streets or Interstate 87, it wouldn't take long for the next car-moose encounter. She had already been hit by a car, but had brushed it off. She and the driver might not be so lucky next time. The whole relocation endeavor went without a hitch thankfully, and as you can see in today's photos and these, she is now back in a safer, although much less exciting environment.